This summer, as workers labored away at a construction site at the southern tip of Manhattan, a team of archaeologists following their progress made an amazing discovery: Booze—or more specifically, the bottles it came in—from the late 1700s. Right underneath our feet. 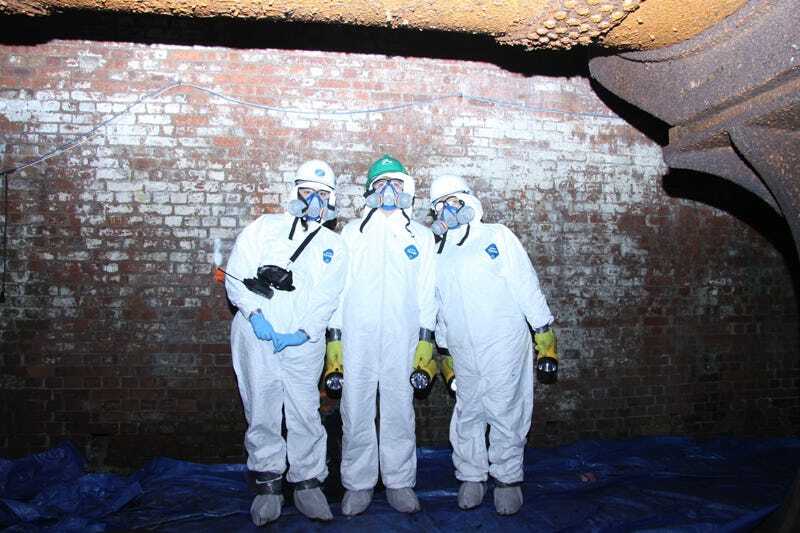 Who were these intrepid urban archaeologists? They’re called Chrysalis Archaeology, a nimble nine-person team based in Brooklyn. And over the past 12 years, they've made some of the most exciting finds in recent memory—from buttons worn by Revolutionary War soldiers fighting in the Battle of Brooklyn to a 300-year-old well used by early Manhattanites. Gizmodo recently had a chance to chat with Alyssa Loorya, the President of Chrysalis, about her work in the city—most of which is now focused on a dig site at South Street Seaport. She was kind enough to answer a few of our questions, below. A 19th century beer bottle from a local brewery. Image courtesy Chrysalis Archaeology. Is there a particular part of the city that interests you the most? This job has turned me into a huge infrastructure geek. To quote a second grader who was part of a class we brought to the South Street Seaport construction site to see the archaeology: "Oh my god, these streets are hollow!" I've been doing a lot with water lately. NYC has this longstanding relationship with water—from digging these deep wells to avoid brackish water, to brewing beer and tea because it masks the taste of the salty water, to laying wooden water pipes. The first pipe system was installed by the Manhattan Water Company, which was actually a smokescreen for Chase Manhattan Bank. They really wanted banking rights, but a water company was an easy way to get them. So there's an interesting history that revolves around trying to get fresh drinking water in NYC. You mentioned the water table has changed—why? When we're doing work at City Hall, for example, all the wells are at nine feet below the modern-day surface. And, through a series of excavations and calculations, we've learned that City Hall Park is actually three feet higher than it was in 1803 when they built it. But the water table today is actually deeper, at over 30 feet below ground. That's because when they were constructing the subways, they had to pump the water out. Even today, they regularly pump millions of gallons of water from the subway system to keep it dry and running. But over time, as you keep pumping water from the aquifers, you alter the natural water table. It's almost like it learns a different pattern. A Revolutionary War-era button belonging to a soldier in the 45th Regiment of Foot, aka the "Sherwood Foresters," which fought at the Battle of Brooklyn Heights. Image courtesy Chrysalis Archaeology. Did Sandy affect the work at South Street Seaport? Sandy flooded everything—the Verizon tunnels and all the trenches... The field office, in an apartment on Water Street, had no internet for three or four months. We follow the construction work, so, if they're not working, we're not working. We had to wait until they got back up and running. But it didn't affect the dig site? No. That's the magic of archaeology. You'd be amazed what survives. Old alcohol bottles turned up at the South Street Seaport dig. What does survive? What are some of the coolest finds from the project? There was so much utility installation that occurred in the early 20th century, but there are pockets that were left untouched—or that were just narrowly missed. We found a wooden well ring—which is the form they used for the base of the well—that we were able to date, using tree-ring dating, to 1718. But, you know, they just missed it when they were putting in those MTA ducts. Or those electric lines. We found this beautifully-built brick structure that was for one of Edison's earliest substations in New York City. And, despite everything—they may have punched a hole through the wall to run some new conduits—the whole thing was still there. It sounds like a puzzle. It is a puzzle. Usually when you think of archaeology, you think of research, and maps, and finding a location, and going to a site and being able to lay it out. But, here, we're piecing together the past within the footprint of modern construction. So we're almost limited to the modern construction footprint, and it's a matter of whether they're going to somewhat align with previous patterns of occupation. More often than not, they do. A bowl decorated with the following limerick: There was an old woman of Leeds Who spent all her time in good deeds; She worked for the poor Till her fingers were sore, This pious old woman of Leeds. Are there are things you would love to look at but can't access? Yes! Inevitably, there's always some piece you can't get to. There'll be this great 18th century wall and it keeps traveling, underneath the sidewalk, but you can't rip up the sidewalk because pedestrian traffic has to continue to flow. And it's not part of the renovation or construction plan. That's something you just accept: You're not going to rip up the sidewalk, and that's OK. Because, in one sense, if it hasn't been disturbed previously, why should we disturb it if it doesn't need to be disturbed? It's OK to say that. We take the pieces and hopefully, some day in the future, someone will build on what we've learned. That's why I'm a real stickler for note taking. Someday, someone may come back to this site and try to recreate what I did. And that's true for archeologists in general. You want to leave a record where people can rebuild what you've done. And then, hopefully, with new insight and technologies, move forward and take the understanding of the past to the next level. Basically, the way I see it, the whole exploration of the past is to understand how we got to where we are today so we can apply that knowledge to the future—in the hopes of making a more sustainable future for ourselves, and for our next generations. Archaeologist Eileen Kao at a City Hall dig. Is there one specific site that you'd focus on, if you could? I'd have to say that every archaeologist has a different opinion. Everybody has different research interests. I've done a lot of research for City Hall—I was very lucky to have worked on the analysis for the large-scale excavations that occurred in 1999, and then to have conducted the excavations in 2010. And there's still more to learn. It's a microcosm for problems of the city that residents might not have wanted to acknowledge: How do we address the poor? How do we address the prisons? How do we address the debtors? In the 18th century, if you were poor and couldn't pay your bills, you went to an almshouse—but you were given a uniform and set to hard labor as a means to help reform you into a productive member of society. That went for widows, people who weren't able-bodied, and even children. Starving children—caught stealing a piece of bread—were sent to the Bridewell, one of the most notorious prisons ever. Women and children were housed next to hardened criminals. The foundation walls of the prison are still there, underneath the grassy area at City Hall. You can look at in in one of two ways—oh, we put the poor and the prisoners in this lovely pastoral area. Well, no, you put them at the most northern part of the city—essentially outside the city—so you didn't have to deal with it on a daily basis. And, as the city grows and you want to take over this property, you move them even further north and you clear it off and create a park for people. Examining a feature exposed beneath modern-day utilities in the South Street Seaport area. It sounds like there are dozens of other sites waiting to be studied throughout Manhattan. New York is such a dynamic city—there's always been so much going on. Even in the 1600s, 18 languages were spoken here. And it's increased exponentially as it's grown. Right down by Canal Street, supposedly, the underground tunnels from the Five Points era are still intact under some of the areas in Chinatown. That's the amazing thing with archeology—you never know. Right down to when they discovered the African burial grounds back in the early 1990s. The area's been built up; it's been developed; it was the last thing anyone expected to find. But, yet, you go deep enough, or you hit the right spot, and the history is still lying there beneath our feet. All images are courtesy of Chrysalis Archaeology. If you're in New York, check out the upcoming Battle of Brooklyn Scavenger Hunt on October 26th.